We’re off to the summit! The GUITAR SUMMIT, that is – held in Mannheim from 8–10 September 2017 for the very first time. A three-day feast of guitars and accessories to touch, listen and test - we’ll be there! It’s always great to see ideas being transformed into products that are then welcomed with enthusiasm by our customers. Take our Modular Interface System (MIS), for instance. This range of DIY splitters now has a new addition – a compact 16-channel model. DMX digital technology for lighting control is the standard found on today’s major stages. 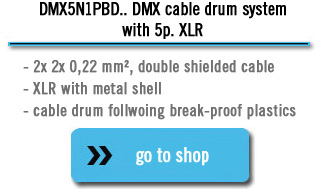 Our new DMX Cable Drum System is designed especially for long transmission distances, combining cables with top-level electrical specs with a breakproof plastic drum. Our OW15Y Multicore Cable now offers colour-coded single wires as well as numbered paired jackets, so that making up with pigtails and connectors is even simpler. The GUITAR SUMMIT will be held in Mannheim from 8–10 September 2017 for the very first time. A three-day feast of guitars and accessories – and an absolute must for us. We’ll naturally be taking our cables along! After all, they’ve always had an outstanding reputation in the guitar world, with top quality and top sound – all designed, developed and made in Germany. From our KIK Series for ambitious entry-level customers to PRO ARTIST for discerning users and right up to the stellar high-end TITANIUM, our portfolio of cables has the ideal product for every need. See and hear them all live at our stand. 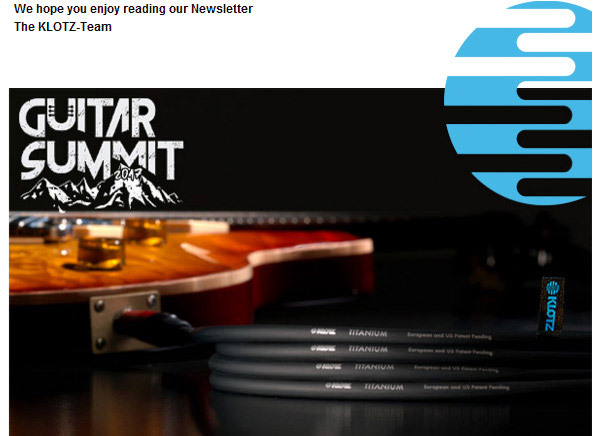 Come and join us at the Mannheim Guitar Summit –we look forward to welcoming you! 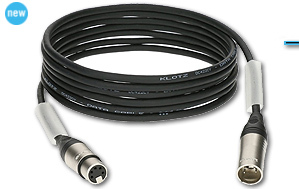 Have you always found your XLR splitter had too few inputs for your purpose? Or unneeded outputs? Or simply took up too much space? Now we can offer the perfect solution! Our Modular Interface System (MIS) lets you decide exactly what your XLR splitter needs. We’ve fitted a whole 16-channel splitter into only two height units and 195mm depth. Inputs/outputs are split in a ratio of 1:3; signals are unimpaired and transmitted one-to-one. We supply the individual components; you put it all together – it’s child’s play. Want to modify the design? Couldn’t be simpler! One module comprises eight high-quality built-in XLR sockets over 2 height units – and those sockets can be varied in line with your needs. On request, we can also perform the assembly and electrical testing. It’s never been easier to build your own XLR splitter. The rugged design, with jacket of durable special PVC and shield of tinned braided copper plus foil, ensures smooth, flawless performance and optimum EMC rating. 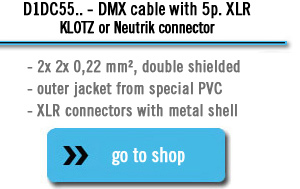 The DMX cable is made up with KLOTZ or Neutrik 5-pin XLR connectors. There’s no getting round it – DMX technology for lighting control is the standard for live performance today. Given this, the cables used must be able to deliver superb signal transmission quality over the lengthy transmission distances involved. Our DMX5N1PBD Drum System is the ideal choice. The OT206PB OmniTRANS used for the Drum System features a rugged design with extra-durable PVC jacket and double shielding, ensuring smooth performance and perfect EMC specs. It offers low capacitance, precise characteristic impedance plus extra-dense shielding – all vital for interference-free connection over long distances. The sapphire blue jacket allows easy identification in even the most complex cabling situations. The reliable, durable cable system is made up with quality 5-pin metal XLR connectors. The breakproof drum keeps both cable ends free, and has a brake – ready to go on the road! The paired jackets in our OW15Y.. Cable now feature white numbering on black jackets for all pairs. This move is in response to a customer’s request and enables the cables to be spliced directly to XLRs without requiring extras like textile sleeves. In addition, KLOTZ colour-coding comes to the aid of customers requiring extra-short lengths, e.g. for mounting D-sub connectors, and who thus require more visual guidance than numbering alone. The colour-coding applies to the individual pairs and is the same as that used in the PolySTAR, PolyLIVE and OmniLIVE series. The "colorcodes" table for KLOTZ multicore cables as well as other useful ducuments e.g. product catalouges, certificates or warranties can be found in download area on our homepage.